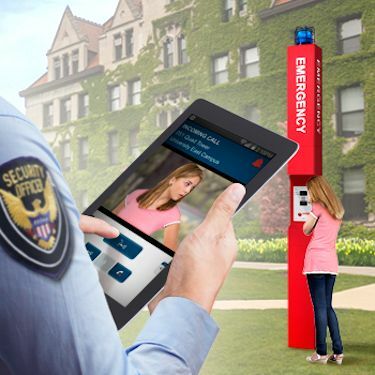 Extra security for campuses, parking lots and ramps! Standing over nine-feet tall, this vandal-resistant emergency communication tower provides high visibility and an added sense of security for your people and guests. Both the LED blue lights on top of the tower and the faceplate are illuminated at all times, and emergency calls can be placed at the touch of a button. When an emergency call is made, the LED blue light flashes, attracting attention to the location. Towers can be strategically placed so other towers are visible. In the case of a chase, the victim can run to the next tower, push the call button and keep moving, leaving a trail of flashing blue lights that can help the security team and authorities speed assistance to a location. Wall-mounted blue light emergency phones are available. Cameras can be mounted on the towers or wall models to provide additional security. The mass notification emergency intercom option provides a key communication tool during a crisis situation and helps save lives.